Slating. It’s a small step during field recording. It lasts no longer than twenty seconds. It simply lists what you’re about to record, and how. That seems basic, doesn’t it? However, slating plays an important role in capturing sound effects. How? Last week I explained what slating is, and how it is done. I also went deeper, and explained the philosophy behind slating, and how it improves your final tracks. That post was about ideas. This one is about facts. It’s a checklist of what you should include in your slates, why, and how you do it. Next week, I’ll share some tools that will help you slate well, and wisely. What: These slates document general notes about the broad scope of a session. They don’t list details about the prop. That’s later. 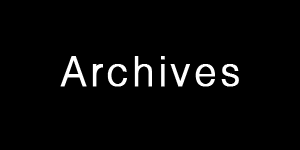 Instead, they describe events surrounding specific field recordings, but not the clips themselves. They explain how your sound effects change, and how one take relates to another. Why: Let’s face it. There’s a lot going on during a field recording session. You’re busy operating gear, encouraging talent, and waving props around. You’re monitoring background, and adapting to the environment. You may be capturing dozens of takes. How can you expect to remember where a microphone was pointed, or the order of props you used, when you’ve punched in a hundred times? This kind of slating helps you visualize the session later, and differentiate takes when mastering back at the studio. This is especially important when differences between takes are not obvious, but affect mastering. Will moving only 200 meters be noticable amongst the howling scream of passing IndyCars? Yes, it may. Perhaps the background PA diminished by 10 dB. Maybe the new location is near a turn, and popping backfire is now noticable. Mastering technicians need to know why a take sounds different from the last. Slate these changes. These slates help you remember what you did, when, and who or what you were working with. The goal for your session. How your next take will change from the previous one. How a series of takes evolved. The date, time, and place, and how that changed over time. How your equipment altered, and why. Reminders about what you did, when, and why. 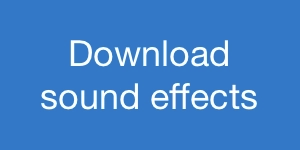 What: These are raw facts about the sound effect, and its performance. They include notes about the equipment used. These details make up the bulk of typical slates. Why: These slates fulfill the most basic reason for slating: to provide information. They describe what you are recording. They’re a list of the sounds you hear. There are dozens of sounds and textures in any recording. You’ll need to describe as many of these details and nuances as vividly as you can. This is especially important when recording many similar takes. Often these will blend together. Additional details enhance each recording, provide vivid imagery, and distinguish each take. This highlights a field recordist’s observational and descriptive skills. Subject. What you’re recording. Most slates would just describe a “high school crowd.” Add more. Qualitative information. “High school crowd” isn’t bad, but we can go farther. What’s their age? How many of them are there? How far are you away from them? What about other props? What’s the speed of a river, or traffic? How wide is the river, and how many lanes is the street? Is it one-way, both directions, or with a boulevard in the centre? Background information. What can be heard in the background? Can you hear traffic beyond the schoolyard? Performance. How is your subject reacting? This is your opportunity to introduce distinctiveness to the take. Is the high school crowd playful or rowdy? Is the traffic eager, or restless? Is the river gushing or lazy? Time. Does the time, day, or season affect the sound of the subject? What: Slates are important to help master raw files. They’ll explain technical details, stats, and equipment notes that help you edit, clean, and polish the audio. 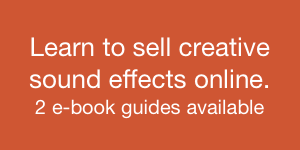 They provide details of the shoot you’ll need for mastering sound clips later. "Tail slate: there was a service vehicle reversing with backing beeps at 1:20. Notch at 1 kHz? Also, there is a faint rumble in the background. Remember to roll off for this take and the previous one. Why: This slating type emphasizes precision. Good slates help mastering technicians know exactly what to expect, and how to deal with it. I wrote earlier about mastering while you record. Think about the mastering stage as you slate. Is there enough information for mastering technicians to edit the effect with confidence? Equipment. What microphones are you using? Are they arranged ORTF? How are they connected to your equipment? Is there a mono mic on channel one, but stereo on three and four? Are you using a special preamp that will affect the sound? Describe everything. Layout. How are the microphones arranged? Are some microphones closer to the prop, and others farther? Yes, a photo will do the same job. However, photos can become mismatched or lost. Describing layout in your slate marries these details to your audio track. Environmental problems. Is there a constant HVAC whine running through your take? Maybe a bass rumble from a distant boat motor in the bay? Describe the problems. Ideas. Do you have a clever idea or creative twist for editing the tracks? Share ideas about your plans to master the tracks. What: These slates add rich detail to help listeners and editors identify and enjoy recordings. It’s information that they may not be able to place by listening alone. Why: In an ideal world we shouldn’t have to slate. Absurd? Not really. If a recording is done well, and our ears are sharp enough, we should be able to identify every nuance in an audio clip: the subject, its performance, time of day, background problems, and the gear used. Some of us can tell props apart by listening alone. Keen ears may identify microphones used, or even preamps. It’s not likely though. Our ears just can’t sense that much detail. Our sonic vocabulary is limited. I’d chalk this up to evolution: our reliance on sight for survival has trumped our aural development. The amount of detail hearing can identify is far less than vision. Our ears can be trained, of course. As sound pros, we’re better than most. 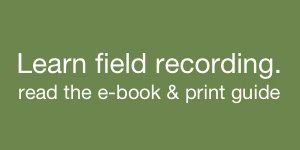 With diligence, we can pick apart a field recording. However, it’s still difficult to describe sounds in detail after the fact. Imagine how lost a recreational listener is when hearing a complex track. Is that hammer smacking Arborite or wooden veneer? We are hearing crowd, but is it 50 or 70 people? How is that truck driving? Is it cornering now, or merely slowing? And at what speed? Good slates will share this information with the listener. The goal is to make the field recording accessible for newbies, or for those not present during the recording (so, everyone else, really). These slates help listeners identify and understand what they’re hearing. Doing this makes your sound effects more useful. Listeners can use the information to compare the clips to the projects they’re working on. Does the amount of crowd match? What about the distance? Are sparrows or robins the right bird for the time of year in the film scene? When the entire experience is slated, it makes the resulting sound effects easier to fit, and to cut. How: Think about the sound effect not from the perspective of a master recordist, but a basic listener. Consider what information will help editors choose a file after it’s complete. Explain recordings details (from step 2) simply. Include incidental information, too (such as the robins and sparrows in a crowd track). What: This type of slate explains why the field recording is interesting or important, when compared to other sounds. It explains why the sound effect matters. Why: Slating with context captures an experience for you and delivers imagination for your listeners. This helps share your files with others. There another reason, too. Context describes how your sound effects are different. Including context in your slates reaffirms that you’re capturing a clip for a good reason: that it is unique, and valuable. Why are you bothering to record? Context explains. Context supercharges your recordings. It provides imagination, depth, and meaning to the audio. It describes what’s important about sound beyond the audio itself. This is especially important to listeners working in creative fields: it broadens their imaginations, and makes their projects more fulfilling. Describe history. Include background detail to help listeners learn about the sound. Share insight. Describe how the sound or prop is different from other, similar sounds. Broadcast emotion. Use power words to describe performances that convey feeling, and mood. I wrote in detail about adding context when slating last week. Read more there. Combining these five reasons into a slate improves your field recordings. They describe your aims, and how takes relate to each other. They share specific details about your prop, and how it was recorded. This aids cleaning the tracks. It helps listeners enjoy them later. And, by noting history, insight, and emotion, your sound effects expand to provide a deeper context to your sessions. 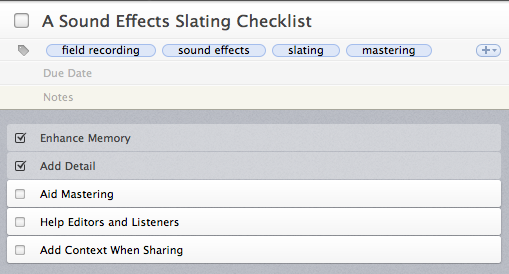 Completing the slating checklist expands your field recordings beyond merely capturing audio mechanically. Yes, it includes tech specs such as density, dynamic, and volume. It shares facts, layout, and performances. It describes what occurs, and changes. However, good slates broaden your awareness of the session. They document an experience. And, when done well, your best slates will share that experience with your listeners, too. Field recording is tricky enough as it is: watching meters, performing props, and coaching talent. Yet the field recordist has another job: to step back from working equipment to capture the experience, details, and context of a sound, and amplify their sound effects with slating. Next week: tools to help you slate well. Photos courtesy of Adam Sporka, Steve A Johnson, Samuel M. Livingston, Keoni Cabral, and Horia Varian.